Mormon Mommy Writers and Friends: So we wouldn't be so scared in the dark. I just finished watching the movie "Genius" and, as a writer and a reader, I absolutely loved it. 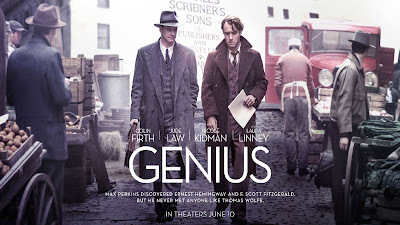 "When, one day of 1929, writer Thomas Wolfe (Jude Law), decided to keep the appointment made by Max Perkins (Colin Firth), editor at Scribner's, he had no illusions: his manuscript would be turned down as had invariably been the case. But, to his happy amazement, his novel, which was to become "Look Homeward, Angel", was accepted for publication. The only trouble was that it was overlong (300 pages) and had to be reduced. Although reluctant to see his poetic prose trimmed, Wolfe agreed and helped by Perkins, who had become a true friend, with the result that it instantly became a favorite with the critics and best seller. Success was even greater in 1935 when "Of Time and the River" appeared, but the fight for reducing Wolfe's logorrheic written expression had been even longer, with 5,000 pages, Perkins managed to cut 90,000 words from the book, and bitter ultimately taking its toll, the relationships between the two men gradually deteriorating. Wolfe did not feel grateful to Perkins any longer but had started resenting him for owing his success to him." The tumultuous relationship between these men was an interesting story in itself, but the more entertaining part to me was the strife of the editing process- a strife every writer knows well, and a strife that I think readers should appreciate more! My favorite line from the movie was when Wolfe, the writer, said to his editor in the middle of a strenuous editing session, "Books are s'posed to be LONG, ya know! Thank crock Tolstoy never met you. We'd have that great novel, 'War and- ' NOTHIN'." LOL! How many of us have ever felt that way when someone starts telling us what we need to cut from our work? My other favorite line came after the editor and the author had passed a soup line in the street and the author wondered aloud about what the point was of him writing these great novels when there were people standing in line for soup on the street. He said it felt frivolous. Later, the editor quietly said to him, "You're not frivolous, Tom. I think, back in the caveman days, our ancestors would huddle around the fire at night, and wolves would be howling in the dark just beyond the light. And one person would start talking, and he would tell a story. So we wouldn't be so scared in the dark." And I just want someone to tell me a story. So if you haven't seen this movie, see it. You'll laugh, you'll cry, you'll feel inspired to write more and write better. And you'll remember why we do it all in the first place.